According to the Institute of Church History of the Ukrainian Catholic University (UCU), before the beginning of World War II the Ukrainian Greek Catholic Church counted 2,387 parishes with the 3.6 million of faithful, including 2,352 eparchial priests, 31 men’s and 121 women’s monasteries, and monastic houses. Under the care of the Church operated a theological academy and three spiritual seminaries where 480 students studied. 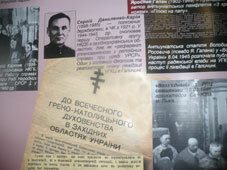 In addition to the already well known fact that Lviv’s “council” of 1946 was a pseudo-church event organized by the state authority of the USSR with the active participation of organs of state security, the Institute of Church History presented a series of documents that were found as evidence of this fact in the funds of the Branch State Archive of the Security Service of Ukraine and the Central Archive of Public Organizations of Ukraine. “To organize an Orthodox eparchy in Lviv, to put at its head a bishop with the title of Bishop of Lviv and Ternopil who will unite Orthodox parishes of Lviv, Stanislaviv, Drohobych, and Ternopil regions… To organize inside of the Uniate Church an initiative group that will declare the breaking with the Vatican and call the Uniate clergy to convert to Orthodoxy,” such directives were set by the Instruction № 58 from the 15th of March, 1945, which were made by the head of the Council on the Matters of the Russian Orthodox Church of the Council of Ministers of the USSR, G. Karpov, and was personally ratified by Joseph Stalin for the realization by the combined efforts of the party administration, state structures, and organs of state security in collaboration with the Russian Orthodox Church. More details with materials from the Soviet archive about the destruction of the UGCC, and also other documented testimonies from the period of prohibition, the underground activity, and revival of the Church can be found in the exhibition dedicated to the 20th anniversary of the legalization of the UGCC, which is finishing in Kyiv. (Starting February 14, as part of the exposition program, the photo exhibition “Toward the Light of Resurrection through the Thorns of Catacombs” will continue in the museum of the city of Brody, in the Lviv region).